Posted on Sat, Mar 31, 2012 : 5:06 p.m. 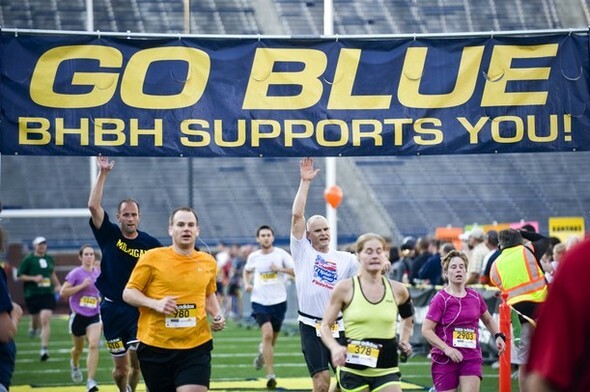 In its five previous editions, football always has been on the mind during the Big House Big Heart Race. This year, there'll be something different in the air. The race, which finishes on the 50-yard line of Michigan Stadium, was moved from the heart of football season in October to April 15 at the request of the Michigan athletic department, which wanted to make it part of its spring football weekend festivities. “We did have concerns,” said Michael Highfield of Champions for Charity, the event organizer. “There’s so many races that sort of, they have their time. Changing the date also meant competing with other local races. Dearborn’s Martian Marathon takes place the day before the Big House Big Heart run. So far, there has been no drop in participation. According to Highfield, they’re actually tracking ahead of their pace from last year, which had almost 15,000 participants. The event consists of a 10-kilometer, 5K and a 1-mile run. The two longer races start on the north side of the football stadium and loop through the Michigan campus, hitting State Street, North University Avenue, Geddes Avenue, Church Street, South University Avenue, Hoover Avenue and Division Street. Portions of each street will be closed off from roughly 7:30 to 10:30 a.m., depending on the street’s point on the course. Course maps are available on the Big House Big Heart website. Highfield started the event when a law partner was dying of Amyotrophic Lateral Sclerosis (ALS) as a way to raise money and awareness for the disease. As a former Michigan letter winner, he remembered the Big Ten Run in the 1980s that finished in Michigan Stadium. “(It) had finished running down the tunnel, around the south goal post and finishing on the 50,” he said. “It was like, ‘It’s been 25 years, we’ve got the greatest college football stadium in the country and we don’t have a race there. We ought to.’” The first year brought in about 4,000 people and 42 nonprofits, raising $172,000. “Every year it’s just gone up exponentially,” said Andrea Highfield, Highfield's wife and executive director for Champions For Charity. Last October’s race saw 175 nonprofits raise $1.5 million. The simple fundraising program developed by Champions for Charity helped. Nonprofits can sign up on the website and download a packet that outlines how to put together a team. Teammates then get family members, friends, co-workers and anybody else they can to pledge money to the team. Apparently, a little Spring Training can go a long way. What: The 6th Big House Big Heart 10K, 5K and 1 mile run. Start times: 10K, 8 a.m.; 5K, 9:10 a.m.; Mott’s 1 Mile, 10:20a.m. ; 1 Mile 10:30 a.m.
Where: Packets picked up at Pioneer High School, April 14. Course: Maps can be found at the Big House Big Heart website. The 10K consists of two loops around campus, the 5K just one. The 1-mile run starts on the Michigan Stadium concourse, runs around the stadium and through the parking lot. Portions of each street in the race will be closed off from roughly 7:30 to 10:30 a.m. Results: Posted on the Big House Big Heart website and on the wall on the northwest and northeast sides of the stadium. Sun, Apr 1, 2012 : 3:09 p.m.
Hopefully, competition with other local races or running events will hold the line down on the crowds. A double edged sword where it is good to see so much participation but there is considerable congestion and will be given the projected turnout.